Italian-Nigerian striker Franklyn Akammadu has been recalled from his loan spell at Tranmere Rovers by Italian Serie C side US Alessandria, informs the Super White Army on their official website. 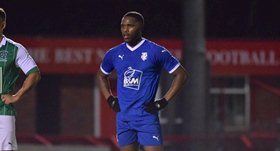 If the initial agreement between both clubs was not broken, the 20-year-old would have remained at Prenton Park until June 2019. US Alessandria took the decision to recall Akammadu as a result of his lack of first-team opportunities. He arrived at Tranmere Rovers in July 2018 and made only three appearances for the club, including two starts in the EFL Trophy against Shrewsbury and Manchester City U23. Akammadu represented Fiorentina, Cesena, Fermana and Prato before joining US Alessandria on a permanent deal in 2018. The Padova born player has not been capped by either Nigeria or Italy at international level.